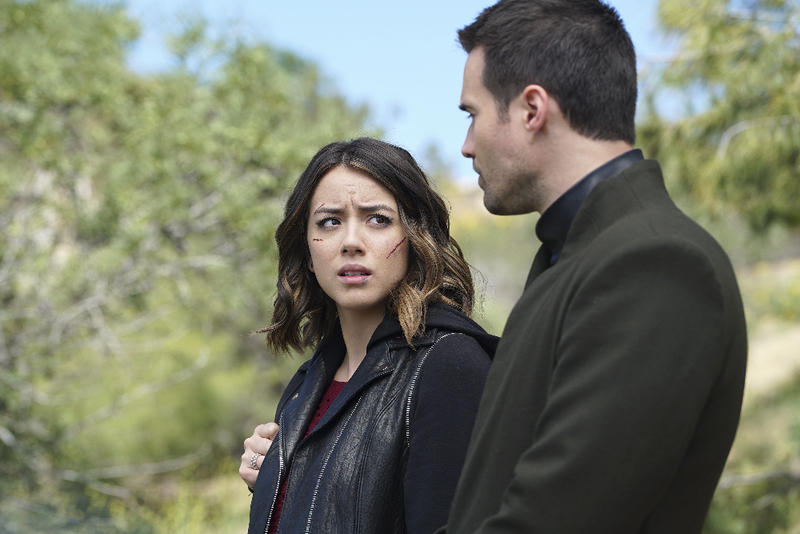 ABC has prepped a small gallery of photos for us today from Agents of S.H.I.E.L.D.’s upcoming April 26 installment. Titled “The Singularity,” the episode will see the SHIELD team left reeling and decimated as Hive continues to sway Inhumans to his side, according to the latest log-lines from ABC for this one. Curiously, the photos show an encounter between Daisy and Not Grant Ward but we would totally still go there. Either Daisy is taking a really big risk in meeting with the smoke monster, or she’s learned of his reluctance to kill other Inhumans. There’s lots to muse over (including the events of Tuesday’s “The Team”) before April 26. Marvel’s Agents of S.H.I.E.L.D. stars Clark Gregg as Director Phil Coulson, Ming-Na Wen as Agent Melinda May, Brett Dalton as Grant Ward, Chloe Bennet as Agent Daisy Johnson, Iain De Caestecker as Agent Leo Fitz, Elizabeth Henstridge as Agent Jemma Simmons, Nick Blood as Agent Lance Hunter, Adrianne Palicki as Agent Bobbi Morse, Henry Simmons as Agent Alphonso “Mack” MacKenzie and Luke Mitchell as Lincoln Campbell. Guest starring are Axle Whitehead as James, John Hannah as Holden Radcliffe, Alicia Vela-Bailey as Alisha, Adrian Pasdar as Brigadier General Glenn Talbot, Alexander Wraith as Agent Anderson, Camille De Pazzis as Anon and Rudy Dobrev as bartender. “The Singularity” airs Tuesday April 26 (9:00-10:00 p.m. EDT) on ABC. Follow @ScreenSpy on Twitter | ScreenSpy on Facebook for more Agents of S.H.I.E.L.D. scoop. MARVEL'S AGENTS OF S.H.I.E.L.D. - "The Singularity"